Hi, I'm Cutest. I'm a rescued shelter cat that owns Ken and Barbi. I want to tell you my story. One cruel, cold day I asked myself, "Where did I go wrong?" Sitting here at the shelter, with my other "co-abandonees," we all backtracked to "the scene of the crime" as to why we were here. I was a kitten born among many other animals in some back-yard breeders place. It was cold, over-crowded and dirty. I witnessed many of my family and friends being torn from each other, to be sold to various people, some of whom didn't even like animals. There was NO discrimination. I was lucky and a little girl spotted me and took me to her home. I thought she really loved me. I was forced to "pack my bags" because my owner had "outgrown" me. She claimed I was no longer "cute" and ignored me so I ran away to join the feral cats. They taught me to scavenge scraps wherever we could; however, I was not quick enough to escape being captured so I was brought here to the shelter, along with others. As a novice rescue, I tried to pick up some life saving tips from the old "vet-pets" here in order to get a good home. I was told that in "no-kill" shelters you have a little more of a chance of living. Still, some of those "no-kill" shelters crowd you in small jail-like cages to live forever, without exercise, handling or training, until you go crazy with cage stress. Then, you are judged "unfit" for a home! "Godzilla", the Chihuahua, gave me advice to stay clear of owners that look like they want pets to match their furniture, because eventually you would be returned along with the old furniture. 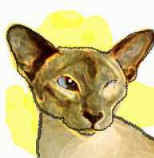 "Ms. Sushi", the old one-eyed Siamese, warned me that only the "youngest and prettiest" were chosen. But she is grateful to the few volunteers that come and keep her company. "8-Ball" the black kitten, was screaming her lungs out because she was the only sibling left from her litter because she was "black", making her feel like the black plague! 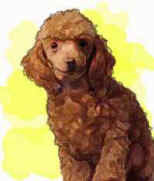 Poor "Noodles" the Poodle. She's overcome with excitement every time she sees someone that resembles her owner. I don't think she gets that he'll never come back. 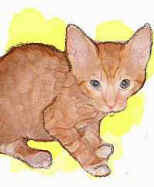 "Tinkles", the orange tabby, had urinary problem, so he was nervous that a new owner would, like before, return him. Now he is more nervous (can't stop peeing) because the peeing may cost him a home. "Bad Pitt" the pit bull, said I was lucky that I wasn't a pit bull because his life would be "the pits" PERIOD!! And down the hall in isolation, was "Patrol", the Shepherd mix. "Patrol" warned us all that only "purebreds" are wanted, and the rest of us were "mistakes". Patrol just wanted a job, he couldn't stop barking. The rest in the shelter could not even speak as they were in shock and broken-hearted. Gosh, I wasn't anything to bring home to mom either. My life was tough being on the run. Because no one bothered to spay or neuter their pets, I was forced into motherhood at an early age, making me a single mom several times. I had only one tooth from trying to survive all the "street fights" while being handicapped because I was declawed. My coat was weather-beaten into "dreadlocks" and I had a bad limp from being kicked by a cruel man. Geez. All of a sudden I felt like a worthless mutt. Old, ugly, damaged and worse.... I was "nameless"! Why me? We put ourselves to sleep at night with this folklore we all heard about. The folklore said that it was true that there were actually humans out there that did not judge us and gave us unconditional love...just like a family member! No pet-racism or kitty bigotry. Best of all, they would not return us because "we did not match the furniture". A promise had been given that even in the worst conditions we would never be abandoned. 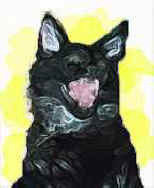 Just as I had this very vision, a rescuer stopped at MY cage, and did not pass by! It was catnip to my ears to hear I was "purr-fect"! Then she, (Sia) took me to the home of someone who looked just like her (but did not smell like her). It was her twin Shane. Though this seemed like heaven, a MAN, by the name of Ken, lived with my new owner, Shane. Yikes! Would he kick me? To my surprise, Ken informed me that men who hate cats have issues with control, since cats are independent and half wild. Therefore, cats are different than dogs. 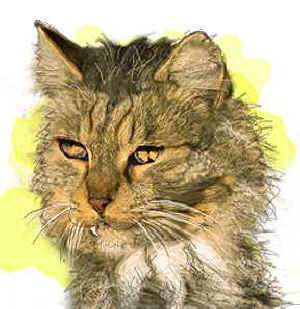 (Cats have been only domesticated 4,000 years, as opposed to a dog for 15,000 years). M-E-O-W!!! I hit the kitty lotto! I am the proud owner of Ken and Barbi. Best of all... they named me "CUTEST", because they don't care how I look or what my background is. I still am burdened with survivor's guilt that my friends left behind don't have a home like me. The folklore could only be true if more people would come to the shelter. Our job as pets is to be so cute and so darn lovable that no one could resist us. 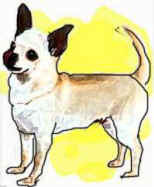 Please adopt from the shelter an adorable pet like me and don't forget to visit my lonely friends at the shelter. Remember, there wouldn't be so many doomed and lonely pets if the owners would choose to spay and neuter!